Believers do not surrender. They can continue on their way to the truth because they are certain that God has created them "explorers", whose mission is to leave no stone unturned, though the temptation to doubt is always there. Leaning on God, they continue to reach out, always and everywhere, for all that is beautiful, good, and true. It is the responsibility of Pastors to encourage, also by their personal witness, the practice of Eucharistic adoration, and exposition of the Blessed Sacrament in particular, as well as prayer of adoration before Christ present under the Eucharistic species. The Eucharist is the full realization of the worship which humanity owes to God, and it cannot be compared to any other religious experience.... The risen Lord... calls the faithful together to give them the light of His Word and the nourishment of His Body as the perennial sacramental wellspring of redemption. The grace flowing from this wellspring renews mankind, life, and history. To be actively pro-life is to contribute to the renewal of society through the promotion of the common good. It is impossible to further the common good without acknowledging and defending the right to life, upon which all the other inalienable rights of individuals are founded and from which they develop. 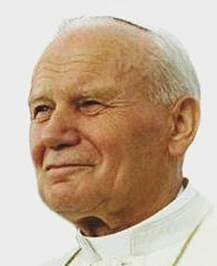 Bio: Pope Saint John Paul II, born Karol Józef Wojtyła, was Pope from 1978 to 2005. He is widely known to Catholics as Saint John Paul the Great, especially in the names of institutions.